Comments: Sometimes called "wildcats," bobcats get their name from their short or "bobbed" tail. They have long legs, toes with retractile claws, dark spotted reddish-brown fur on top and gray fur with black spots on their belly. Their dens are found in brush piles, hollow logs, caves and in rock outcroppings. They hunt alone from dusk to dawn and rarely use the same daytime resting area. 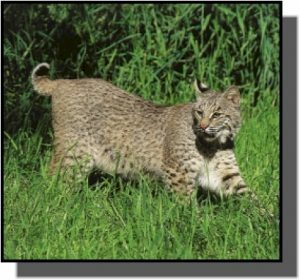 Bobcats mark their territories with urine and feces. Females usually bear a single litter of 2-4 kittens in the summer. They may live up to 14 years in the wild. Distribution: Bobcats have the widest distribution of native cats in North America ranging from southern Mexico to southern Canada. They are found in Kansas shrublands and woodlands. Food: Half of the diet of bobcats consists of rabbits and hares. They also feed on mice, rats, birds and occasionally on fawns and injured adult deer.